1981 Gorham American Heritage Horse and Sulky Ornament. Very Hard To Find Great Condition! American Heritage Publishing Company commissioned Gorham Silversmiths in 1972 to create a line of sterling silver ornaments based on historical themes and items to be issued annually. Trotting steadily along, this handsome horse pulling a sulky and the determined rider will be a race winner on your Christmas Tree. Originally called Sulky Rider, this wonderful ornament is in excellent condition with no wear or issues of any type that I can find. Horse and Sulky is appropriately hallmarked and comes with original tarnish resistant pouch and Gorham box. Ornament is approximately 4 1/2 inches long and 2 1/4 inches tall at the top point. This is an especially hard one to find because of the high price of silver in the 80's. Another fantastic find for your Christmas ornament collection, or a fabulous gift for the collector on your gift list. Thank you for your interest! If by some small chance your item is not satisfactory, your return should still be received within 7 days or less. Be sure to check my other listings for many Towle 12 Days of Christmas sterling pendant /medallion / ornament / charms, Gorham, Lunt and other sterling ornaments, and more great gift items, Victoriana, Elegant Glassware, Vintage Clothes and Shoes etc. 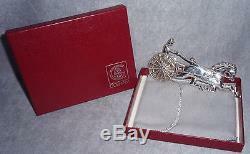 The item "1981 Gorham American Heritage Sterling Silver Horse & Sulky Rider Xmas Ornament" is in sale since Wednesday, January 02, 2013. This item is in the category "Collectibles\Holiday & Seasonal\Christmas\ Modern (1946-90)\Ornaments\Metal". The seller is "dkoldtiques" and is located in Barry, Illinois.